Just days before Martin Luther King, Jr. would have turned 90, members of the slain civil rights leader’s inner circle and others who fought to end to racial segregation in the 1960’s convened for four days of talks at Sunnylands. “The purpose was to reflect on and examine the important lessons of the non-violent movement that did so much to change America and the world,” said Sunnylands President David J. Lane. 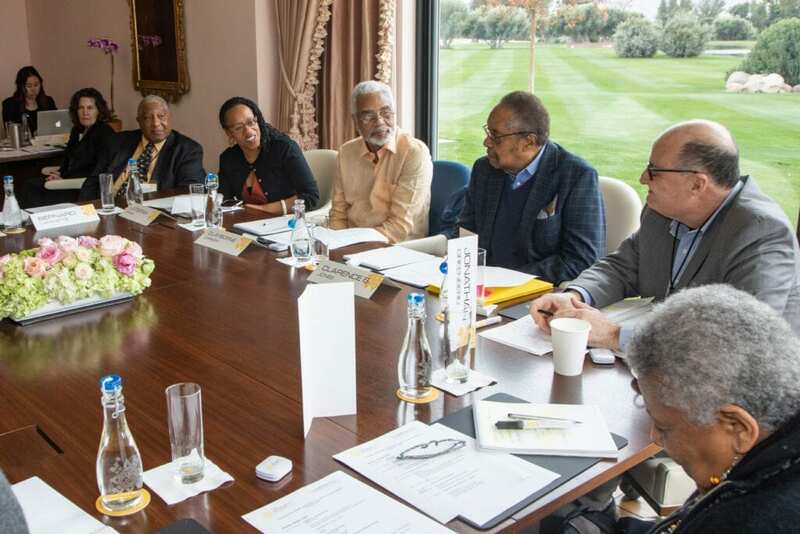 As co-founder of the Gandhi King Institute for Nonviolence and Social Justice at the University of San Francisco, Dr. Clarence B. Jones partnered with The Annenberg Retreat at Sunnylands to reunite some of the luminaries of the civil rights movement, along with noted historians and scholars. Jones was King’s personal attorney and speechwriter who helped draft the famous “I Have a Dream” speech. Other participants of the Jan. 3-6 retreat included Andrew Young, the former United Nations ambassador; Joan Baez, the renowned folk singer and activist; Minnijean Brown-Trickey, one of the “Little Rock Nine” who integrated Central High School in Little Rock, Ark., in 1957; and Taylor Branch, the Pulitzer Prize-winning historian. The group of 18 retreat participants also wanted to pass on their wisdom to a new generation. Some participated in videotaped interviews about their experiences fighting alongside King in the segregated South. They also conversed with a number of social activists who are waging campaigns today on a range of issues, from the expansion of voting rights to combating gun violence, who joined them in dialogue at the Sunnylands gathering. After the convening in Rancho Mirage, some of the retreat participants issued a statement, titled “A Call to Conscience on the 90thBirthday of Martin Luther King, Jr.,” urging a renewed push of nonviolent activism. “Nonviolence is the heart and soul of our movement because we are united in a struggle against violence in all its forms,” the statement said. In January 2019, Sunnylands and the Gandhi King Institute for Nonviolence and Social Justice were privileged to host a gathering of many of Martin Luther King Jr.’s closest advisers.